Monday, March 4th, 2019: Trips. I didn’t move to the mountains of southwest New Mexico, near the Gila Wilderness, because I loved the landscape. I actually found it boring because unlike the mountains of my beloved desert, these mountains are heavily forested, and there’s very little exposed rock. But it’d be a sin to live in a place surrounded by wild, undeveloped natural habitat and not take advantage of it. Gradually, I learned about local trails and special places from my new friends, and as my body started to fall apart and I could no longer handle the impact of running or the unnatural posture of cycling, I needed challenging hikes to maintain my cardio fitness and lower-body strength. Paradoxically, the vast Gila Wilderness was one place I avoided from the beginning, because it encompasses the higher elevations of the Mogollon Mountains, and I could see that the peak trails were all forested in, without the long-distance vistas and sightlines that I enjoy in the desert. I respect forested habitat, but it’s a lot less interesting to me than open country with endless views. Then our series of severe wildfires began, and in May 2012, the high core of the Mogollon Mountains was consumed. My hikes in other areas began to take on the theme of fire adaptation as I trekked through burn scars, but it took me a while to realize that now, I could probably venture into the Gila Wilderness and get the views I needed, because much of the forest had been killed off. After the fire, it was many years before the Forest Service began to clear and reopen a few of the formerly vast network of wilderness trails. Hundreds of downed trees, so much erosion, required a tremendous effort to clear, and so far, seven years later, only a very few trails have been reopened, and even those are quickly re-damaged by erosion and deadfall within months after work crews leave. This area is a longer drive from home – it takes me over an hour to reach a trailhead into the wilderness – but I could see from the maps that I could reach higher elevations on these trails than I could on the ones near home, so it would make a great weekend expedition. After studying the Forest Service website and online topo maps, I picked a trail that could net me 3,000′ of elevation gain in 5 miles, and set out, on a beautiful day with blue skies, fluffy white clouds, and moderate wind. The forest road to the trailhead was an adventure in itself, cut into the precipitous wall of a canyon, rising steeply into pinyon-juniper woodland. I entered the wilderness after less than half a mile of climbing, and traversed into a part of the canyon that had been burned intensely but now carried roaring meltwater from heavy winter snows, with added color from new grass, red boulders and carpets of rust-colored oak leaves. In the canyon bottom there were already many fallen snags blocking the trail, requiring frequent detours. After two miles the trail turned north into a shady side canyon and began to climb more steeply along the tributary stream, below snow-patched eastern slopes. I stopped for a short lunch after another mile, then followed the trail up switchbacks in dense, unburned pine forest. High on this eastern slope, the trail crossed the side canyon to climb steeply toward its southern shoulder. It was a hard slog that just went up and up without relenting, for about a half mile. And when it finally turned back north, it was even steeper. I was really laboring but I was determined to push myself and go the full 5 miles and 3,000′, which would be a milestone in my recovery. The trail finally reached another turning point, and entered a forest of tall pines where the fire had blown rapidly through, killing sporadic trees but clearing all the undergrowth, leaving steep tan-colored slopes of dirt and gravel that were sterile-looking even seven years after the fire. I could see the skyline around me through the trees and felt I was approaching 9,000′ elevation, but I couldn’t tell where the trail went from here. After traversing this new slope for another quarter mile, past patches of snow, I reached a section of trail where snow had drifted across at a steep angle. I tried kicking steps for myself in the treacherous slope, but a few yards across I realized there was ice under the snow. If I slipped, I’d fall far and surely be injured. I made my way back and looked for a detour, but the slopes above and below were equally daunting, consisting of gravel loosely embedded in dirt saturated from snowmelt. My recovering foot felt like it was nearing its limit for the day, so I decided to turn back. When I got home, I re-checked the topo maps and discovered I’d hiked over 8-1/2 miles round-trip and reached my goal of 3,000′ of cumulative elevation gain, despite having to turn back at the snowdrift. In retrospect, I realized that I still hadn’t found the wildfire-cleared slopes and open-country views I’d been looking for, because naturally, the Forest Service had focused on clearing trails in less-burned areas where crews faced less damage to repair. Maybe if I’d been able to go farther, I would’ve entered the backcountry where the fire did more damage, but I have no idea when or if I’ll be able to do that. So…a month and a half later, I went back to finish what I’d started: climbing over the crest, for a view into the back country, with its high peaks. During the intervening weeks, I’d been carefully, and very gradually, tackling higher elevations and longer distances, trying to take care of my foot while walking on difficult terrain: crusty snow, avalanche slopes, loose rock overgrown by deep grass. 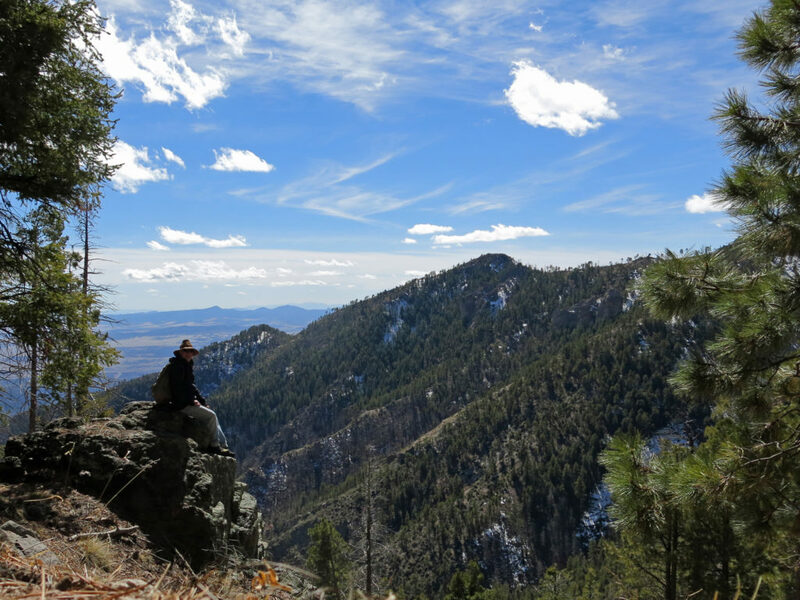 On this return visit to the Gila Wilderness, my experience of the trail was very different. I found the lower part of the trail much harder than the upper part, which just goes to show that the state of your mind and body are as important as your external environment. I’d started the hike with a certain lack of confidence, but when I passed the point that had stopped me before, I felt liberated. I knew I was going to make it over the crest and into the burn scar of the big wildfire, where I’d get a view of the backcountry with the highest peaks of the range. The creek’s roar was toned down by now. Deciduous trees in the canyon bottom wore spring’s bright green foliage, wildflowers were coming out, butterflies were swarming. The banks of the creek were blanketed in lurid green grasses and forbs, and the golden bunch grasses on the slopes above had already gone to seed. There’d been another vehicle parked at the trailhead before me, and a Silver City couple had signed in to the trail log before me. I encountered them about a mile and a half in. When they saw me coming through the riparian forest, they began scrambling about, and when I emerged fully into their view, the hysterical barking began. It was a man and woman in their 70s, and the two of them were hugging a Rottweiler and a Shepherd each, holding them upright, barely restraining the big dogs as they filled the canyon with their violent barking, jerking and straining against their elderly owners to get loose so they could attack me. “Sorry! Sorry!” the owners kept shouting, but the dogs were so loud and so agitated that there was no question of me answering, let alone stopping to have a conversation. So I smiled and shook my head and continued up the trail, and eventually the barking ceased behind me. If dog owners assume strangers are afraid of their pets, why do they impose their pets on us like this? I actually never have a problem with the animals themselves – the scourge of pet ownership is mainly down to pet owners’ irresponsibility, and it really has become a scourge, as a result of social media. Now, it seems like irresponsible pet owners form the majority. Dog owners, in particular, selfishly impose their antisocial pets on the rest of us, self-righteously adopting abused “rescue” animals and neglecting to train them or take responsibility for their behavior in public. And over and over again, when I’m in nature looking for wildlife, what I find instead is out-of-control pets and thoughtless, neurotic owners. I labored up the side canyon, the trail’s grade exceeding 40% in places, through mature, dark, unburned forest with looming lichen-encrusted boulders and outcrops. There, a small hawk, maybe a male Cooper’s, dropped improbably to a limb in the dense lower canopy to check me out. After that, the switchbacks at the canyon’s head, and the long traverse to the stark, sparsely burned upper forest. A quarter mile beyond where I’d stopped in early March, I came to the runoff from a spring perched above the trail. The trail switched back again and climbed through the upper edge of the unburned forest toward the sharp edge of an outlying ridge. 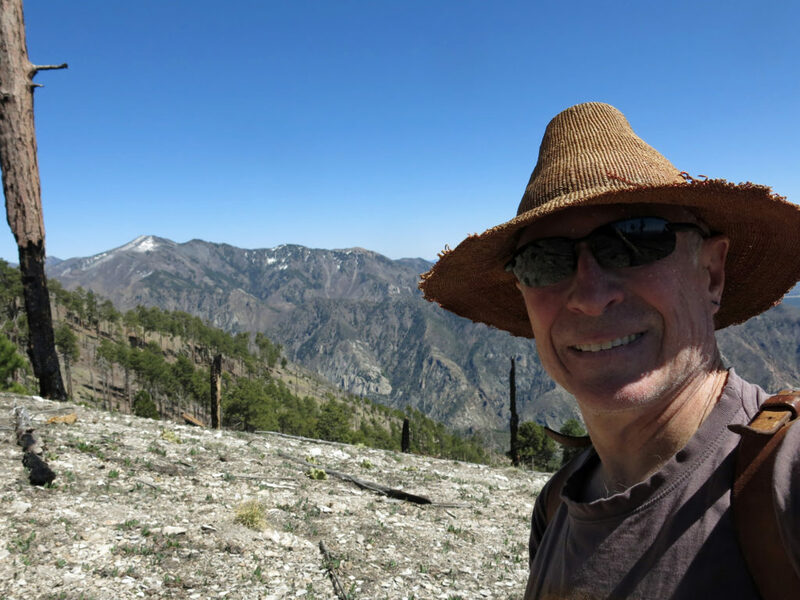 I was already above 9,000′, and when the trail rounded the edge of the ridge, I entered the burn scar and saw the back side of Sacaton Mountain, five miles away across Big Dry Canyon, still draped with snow. On the stark east-facing slope ahead of me, young firs and pines had already established themselves at the feet of the remaining fire-killed snags. From here, it was only a short climb to the actual crest, at 9,500′, where thickets of aspens had sprouted after the fire, but hadn’t leafed out yet this season. Through the thickets I glimpsed the peaks of the range laid out in the distance to the east, each carrying the last snowfields of winter. I walked down the trail another half mile on the far side, just to get a sense of it, but I’d already reached my objective and didn’t want to lose more elevation that I’d just have to regain. Besides, this part of the trail seemed to be completely hemmed in by dense aspen thickets. Young firs and pines sprouting in the burn area along the crest – natural regeneration, or the work of the Forest Service? The payoff for all my efforts: a view of the high peaks of the range: Whitewater Baldy, Center Baldy, Black Mountain, Mogollon Baldy, and Sacaton. Before the fire, this entire landscape was dark green, blanketed by forest. It was gusty up there and I often had to hold onto my hat. I had a really hard time with my footing on the way down, trying to maintain grip and balance on loose rocks and the thousands of broken, rolling fragments of branches from trees that had fallen across the trail since winter. Struggling down a steep slope, trying to keep weight off the chronically injured ball of my foot, using the muscles of my ankle and foot to leverage my stiff boot as a semi-rigid platform, I ended up walking the five plus miles back to the trailhead with a pretty unnatural gait. This seems to be the new normal – I’ll never be able to forget this chronic injury, and I’ll never be able to keep up with robust hikers on treacherous ground. And I knew that after I got home, I’d need to ice my foot and do contrast bathing for a couple days, to get rid of inflammation, before going out for another hike. But I was elated the whole way back, and even more so on the drive home, as my accomplishment began to sink in. Careful study of the topo map, elevation profile, and a GPS coordinate I logged before turning back, would show that I hiked a little over ten miles round-trip but climbed over 3,700′, the most I’d climbed in one day in over 40 years, since I was in my 20s. All in all, it was one of the six biggest day hikes of my lifetime, although nowhere near my 6,234′ ascent of Volcan Atitlan in 1978 or my 18-1/2 mile traverse of Utah’s Boulder Mountain in 1990. The pictures hint at, but don’t fully convey how spectacular it was up there on the crest. The human eye is so far superior to the camera and digital screens – I was reveling in the details of the snowpack on distant peaks, which barely shows up in the photos, and I could see the rectangles of pastures, cropfields and farms many miles away and many thousands of feet below, through narrow passes in the outer ridges, which are totally invisible in the high-resolution photos I took. It was great to be able to stride along the ridgetop, seeing the vast landscape shift around me in three dimensions, because the forest had been burned away. But it was also great, and surprising, to see patches where the forest seemed to be regenerating way up there on the crest, with abundant young trees and seedlings, in exactly the same mix of the parent forest, without any intermediate “successional” vegetation. The old notion of ecological succession was clearly an oversimplification – or could the Forest Service be doing some re-seeding? The trail I hiked continues on for another four plus miles, to the heart of the wilderness where it intersects with a bunch of other trails which haven’t yet been restored since the big fire. There seem to be plenty of springs along the way, even at high elevation, so it might make for a good backpacking trip, a further exploration of wildfire adaptation. No end of future challenges!